In the coming weeks meteorologists will be looking back at the Hampden County tornado trying to learn something from the unique set of meteorological conditions that came together on June 1st. All the signals were there for a classic, significant, and high end severe weather event. Unfortunately the tornado that hit Springfield did so without warning. The National Weather Service in Taunton, Massachusetts covers Hampden County and didn’t issue a tornado warning until 13 minutes after the tornado was on the ground. 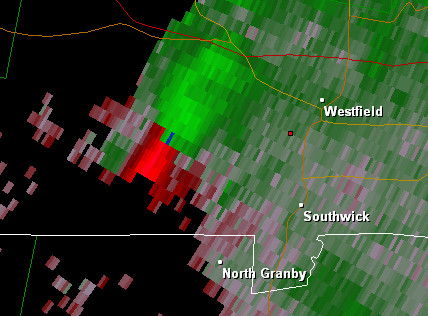 It appears part of the issue was that the radar in Taunton was unable to sample the storm well until the storm was over Westfield (and moments away from producing a tornado). The Albany radar, which was initially closer to the storm, had a much better vantage point and had indications that a tornado may be forming well before the warning was issued. Here’s the radar from Taunton (BOX) at 4:08 p.m. This image shows reds or winds blowing away from the radar and greens where wind is blow toward the radar. BOX Storm Relative Velocity 4:08 p.m. This storm is too far from the radar site and range folding is taking place. RF occurs when radiation from the echo is sent back to the radar site in Taunton after the radar has emitted a second pulse of energy. The radar is unable to resolve whether the energy scattered back to the site is from an echo far away or nearby. The purple shading on the radar is RF. The Albany radar (ENX), however, is able to sample the echo well without range folding. ENX Storm Relative Velocity 4:06 p.m.
You can see in this radar shot the tornado vortex signature clear as day 6 miles west of Westfield coming off the Berkshire Hills into the Valley. The “couplet” of greens next to reds indicates winds blowing in opposite directions in a very short horizontal distance. This indicates that at 6,000 feet above the ground this storm is rapidly rotating and capable of producing a tornado. There is about 75 knots of gate-to-gate shear in this image which means the difference between inbound and outbound velocities in neighboring pixels is about 85 mph. The following radar image at 4:11 p.m. indicates that the couplet has weakened some with only 50 knots of gate to gate shear but 5 minutes later at 4:16 p.m. the couplet rapidly tightens with over 110 knots of gate to gate shear virtually over Westfield. Shortly after these radar scans the storm comes out of range fold on the BOX radar and by 4:22 p.m. 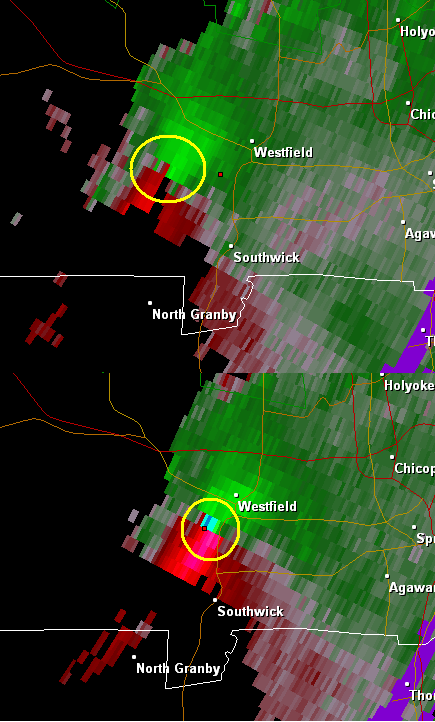 BOX has 2 consecutive radar scans with over 100 knots of gate to gate shear between Westfield and West Springfield. BOX Storm Relative Velocity 4:22 p.m. The range folding on Doppler radar is unavoidable. However between 4:06 and 4:30 at least one radar (ENX or BOX) indicated a very strong low level mesocyclone during each volume scan. The tornado warning did not come out until 24 minutes after radar indicated a rotating (sometimes very strongly) storm. In fact the tornado touchdown (at 4:17 p.m.) wasn’t even preceded by a severe thunderstorm warning (that came at 4:18 p.m.). Once the tornado warning came out the radar signatures became more impressive with a couplet, hook echo, and debris ball just as impressive as anything you’d see in Oklahoma. In fact this was probably one the more impressive set of radar images I’ve ever seen. BOX storm relative velocity and base reflectivity at 5:04 p.m. This storm shows the limitations and the power of Doppler radar. Switching the radar into VCP 212 with more slices and faster update times increases the range fold problem. Having to monitor multiple radar sites for a storm that can only be sampled between 6-7,000 feet AGL at the lowest slice adds to the difficulty in warning a storm like this. The National Weather Service does a phenomenal job almost all the time with some of the best minds and best technology in the field. Unfortunately this is one of the rare times a strong tornado struck a highly populated area without warning. Given the amount of YouTube video shot from downtown Westfield of the tornado touching down around 4:17 p.m I am at a loss for how news of the touchdown didn’t reach the NWS. To the best of my knowldge confirmation of the touchdown didn’t make it to the National Weather Service until the storm was over Springfield nearly 15 minutes later! Did local law enforcement or storm spotters not relay information to the NWS? With a strong tornado traveling through a populated suburb of Springfield in broad daylight it’s a problem that the NWS did not know about it for nearly 13 minutes. Barnes Airport did report a funnel cloud at 4:24 p.m. but they did not report an actual touchdown. This appears to be the first report of a funnel cloud the NWS received but it’s unclear when the report actually made it to the person who was issuing the warnings. Being unable to clearly sample a storm near the surface increases the difficulty of issuing accurate warnings. Not getting ground truth reports from affected areas makes the situation even worse. The National Weather Service also has to be careful not to issue warnings for every storm that rotates to avoid the Boy Who Cried Wolf syndrome. It’s a fine line that they and the media walk in storms like this. We will all learn from this storm and hopefully the public will learn how important it is to take tornado warnings seriously. For posterity here are the tweets I was furiously tweeting as the tornado ripped across western Massachusetts. Barnes AFB reports a funnel cloud. Strong storm with rotation heading toward Springfield. very strong rotation over downtown Sprinfield. No immediate threat to CT. Warning is out of an abundance of caution. Police report a tornado on the ground in Westfield Mass!!! Storm passing north of Stafford now… does not appear to be deviating in track. Will miss CT.
WWLP showing live pics of houses without roofs in Springfield. Wibraham, Holland, and Sturbridge take cover. This is a very serious and life threatening situation. Storm heading into Worcester County JUST north of Woodstock looks even stronger. Extremely dangerous and life threatening situation. Debris ball on radar indicates tornado has picked up parts of trees and houses thousands of feet in the air. Heading straight to Sturbridge. Debris ball on Rt 20 in Brimfield and Fiskdale, MA. Closer to home… hail likely in 2 CT cells. 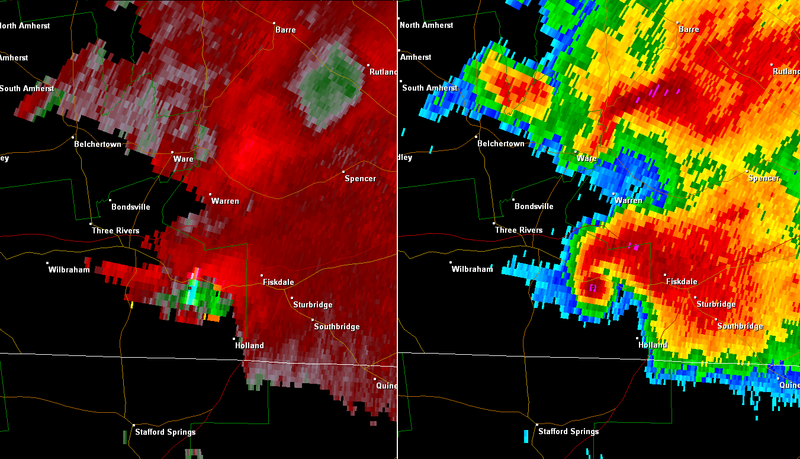 One near Clinton and another heading to Willimantic. National Weather Service reports tornado touchdown on I-84 in Sturbridge. Damage in Springfield looks pretty bad but I am fearful the damage east toward Sturbridge is going to be much worse. Update: As expected the NWS confirms at least EF-3 damage. A damage survey is being conducted by the National Weather Service across western Massachusetts to determine the strength of the tornado based on the damage produced from Westfield to Southbridge. Wikipedia has a fantastic article on the Enhanced Fujita Scale including information on the degree of damage indicators investigators will be looking at. 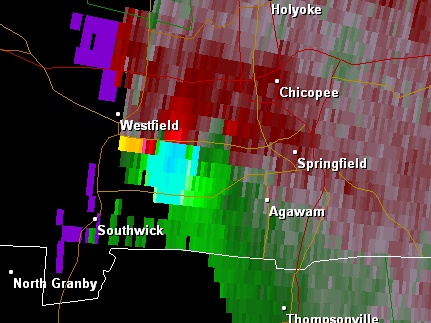 Just from the video I’ve seen and what I’ve seen personally as best I can determine the tornado touched down in Westfield and moved through West Springfield, and Springfield and then may have lifted in Wilbraham for a period of time. The damage up to this point was consistent with EF-2 damage though it’s possible there was a pocket of EF-3 damage in there but the National Weather Service will have a more definitive answer this afternoon. The tornado touched down again somewhere near the Monson/Wilbraham line and continued east into Brimfield and then Sturbridge and Southbridge. There appear to be pockets of EF-3 damage in Monson and Brimfield (possibly Southbridge too?) and it’s conceivable that some EF-4 damage occurred. The construction of the buildings needs to be taken into account so it’s impossible for me to judge even having seen the damage up close. The Weather Channel’s Eric Fischer reported last night that one of the questions in the damage survey was how well constructed old wood frame houses are compared to modern construction. Again these are just my impressions based on the damage I saw in person and on video the NWS will release the final information. I’ll try and post a more detailed meteorological review of the tornado this weekend. It appears that this tornado was another classic example of tornadogenesis occurring in a north/south oriented river valley in New York or New England. I’ll also try to post more on the damage and rating of this tornado once the National Weather Service releases their findings. This video appears to be one of the first of the tornado forming. 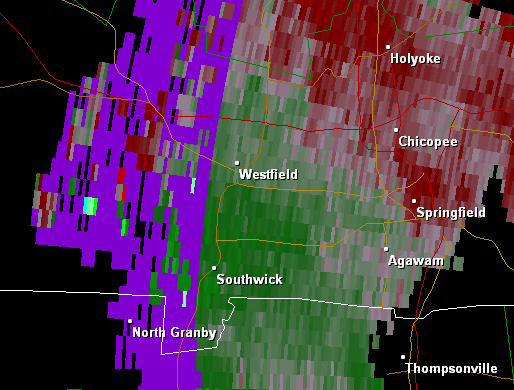 Notice the rotating wall cloud with funnel developing and lowering as the storm moves east across Westfield. The video was shot from the Easthampton Savings Bank in downtown. Damage started just south of downtown and continued east toward West Springfield. The tornado appears to have hit Westfield at about 4:23 when Barnes Airport reported a funnel cloud in their weather observation. The tornado continued into West Springfield where some guys at Central Chevrolet capture the storm at a very close distance. Probably only 1/8 mile away. An amateur storm chaser caught the tornado moving overhead in West Springfield shortly before crossing the Connecticut River near the Memorial Bridge rotary. He’s very lucky not to have been seriously injured as the tornado passed literally right over his car. The tornado then crossed the Connecticut River almost over the Memorial Bridge in one of the most dramatic tornado videos you’ll ever see. This should dispel the myth that tornadoes can’t hit someplace near a lake or river or ocean. This next video was shot on the intersection of Parker Street and Wilbraham Road on the east side of Springfield looking toward Wilbraham. This is clearly a mature and very significant tornado at this point doing severe structural damage in the western side of Wilbraham. The tornado appears to have lifted for a short period of time over Wibraham before touching down again in the east side of Wilbraham near Monson. Here’s video from that town which should a mature rotating wall cloud and tornadogenesis occurring again. In Monson I haven’t seen any videos of the actually touchdown but we know it did because the damage is just horrific in town.